When you start plants indoors for outdoor planting later on or move established potted plants to larger pots, sometimes the plants will get shocked and start to die on you. This phenomenon is known as transplant shock and happens because the plants’ roots were likely damaged during the transportation process. Epsom salt, according to Balcony Web, can help plants overcome transplant shock. If your plants are experiencing transplant shock, feed Epsom salt to them either by sprinkling on the topsoil near the base of the plant and then watering or putting a little salt into the hole or planter you will be planting your plant. Next, cover the salt with a little dirt before planting your plant on top. If your lawn isn’t lush and beautiful, it probably needs a little magnesium in its life. To perk up grass, Best Plants suggests adding 3 pounds (1.35 kg) of Epsom salt to every 1,250 square feet (116 square meters) of grass and then watering your lawn. Tree stump removal can be costly, but if you don’t have the money to get a stump removed, let Epsom salt come to your rescue. Best Plants recommends drilling holes into the stump and filling in the holes with Epsom salt. In weeks, the stump will begin rotting. Roses are beautiful, but they can be tricky to grow. Epsom salt makes it a little easier. According to Natural Living Ideas, adding Epsom salt to rose bushes encourages them to produce larger flowers with darker, deeper colors. To incorporate Epsom salt to your rose bush’s diet, add it at the time of planting and when flowers are in bloom. In sunny areas where palm trees thrive, one of the most common things to see is palm trees that are yellow at the top. This look, which Best Plants likens to a bad hair day, is called “frizzle top” and due to a lack of magnesium. You can restore your palm trees to health by spraying the crown and base with Epsom salt and water. Leaf curling is a sure sign of a lack of magnesium in a plant. If the leaves on your plant are curled, amend the plant’s soil with 1 tablespoon (15 ml) of Epsom salt. Epsom salt, when added to the soil around plants, helps them absorb other nutrients more efficiently. In fact, according to Best Plants, most commercial fertilizers have large amounts of magnesium. By adding plain Epsom salt, you won’t have to bother with so much fertilizer. When ferns are yellow and dull-looking, they don’t look great. Epsom salt helps ferns and plants similar to ferns, such as elephant ear, have rich, dark foliage. Add 1 tablespoon (15 ml) of Epsom salt to a gallon (3.8 liters) of water and spray ferns and elephant ears to achieve the look. 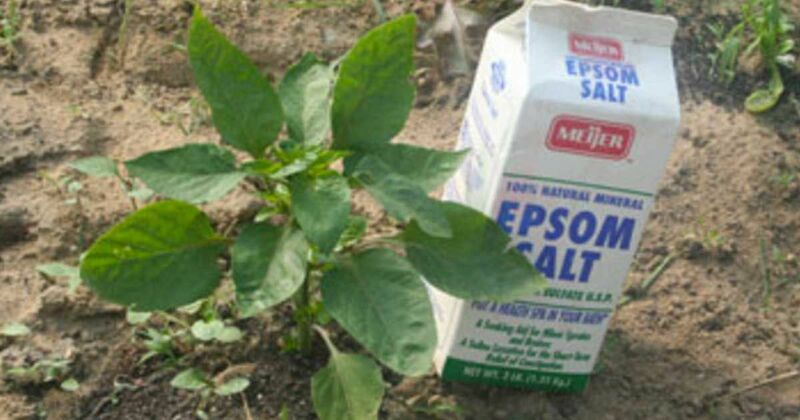 Epsom salt is incredibly useful in the home garden. In addition to helping plants get more from the surrounding soil, Epsom salt also enhances the flavor of fruits and veggies, keeps leaves green, stops transplant shock and deters pests.